There's been much rumour and speculation that Leica might be about to produce a compact system camera, a smaller version of the full-frame Leica M with a 1.3x crop factor sensor like the Leica M8, or maybe an APS-C format sensor, but that is still compatible with M-mount lenses. The company's recent teaser campaign prior to the announcement of the Leica X Vario that referred to the "Mini M" sent many Leica lovers into overdrive. However, the Leica X Vario is a compact camera, and it has a permanently attached lens. Significantly, this is an 18-46mm f/3.5-6.4 zoom lens, which produces images on a par with a 28-70mm lens on a full-frame camera. In comparison, the Leica X2 has the equivalent of a 24mm f/2.8 lens, and some may be disappointed by the comparatively slow lens on the Leica X Vario. The Leica X Vario also uses the same 16 million pixel APS-C format sensor as the Leica X2. It's available now, priced at £2,150 (around AU$3,540 / US$3,340). If you want to keep things simple and concentrate on getting the composition, shutter speed and aperture right, the Leica X Vario's sensitivity and white balance can be set to automatic. Helpfully, you can also specify the uppermost sensitivity value to use, as well as the lowest shutter speed. If you prefer to take control over the sensitivity, it may be set in the range ISO 100-12,500. There's also the usual array of preset white balance options, in addition to two manually set values and a colour temperature mode. Further control over colour is afforded by the Film modes. In addition to the Standard option, the Leica X Vario enables you to shoot images in Vivid, Natural, Black and White Natural and Black and White High Contrast modes. Images may be saved to the SD/SDHC/SDXC card in DNG raw file format or as JPEG files, or as both simultaneously. The Film modes are available with both image file formats, so if you use the high contrast black and white option and shoot raw and JPEG files simultaneously you will have a monochrome JPEG and a DNG file with all the colour data for post-capture processing. Metering can be set to the general purpose Smart multi-segment option, as well as centreweighted or spot metering - which is helpful in tricky lighting conditions, such as when the subject is backlit. Automatic focusing is possible as well as manual focusing, and there are four AF options, 1-point, 11-point, spot and Face Detection. As in 1-point mode, spot AF mode enables you as the photographer to set the AF point, but the size of the AF area is smaller. In continuous shooting mode, images may be shot at up to 5fps for a maximum of eight exposures when raw and JPEG files are recorded. Although the Leica X Vario has a hotshoe to accept a flashgun such as the Leica SF 24 D (£270/US$350), there's also a pop-up flash. This flash unit may be set to fire automatically, or on-demand for fill-in purposes. There's also a red-eye correction option, as well as slow-sync mode and first or second curtain synchronisation. Unlike the Leica X2, the Leica X Vario is capable of shooting Full HD (1080p) video at 30fps in MP4 format for easy sharing. Leica has used a similar design to the Leica M for the Leica X Vario, and it feels beautifully crafted and solid, without being too heavy. It is, however, quite large overall for a compact camera. The body is only a little bigger than the Leica X2's, but the lens is significantly larger. This makes it less likely to be slipped into a bag, and it's doubtful it will find a home in a coat pocket unless it's the type that's designed to carry a pheasant home from a shoot. Like the Leica M's the Leica X Vario's top-plate has been machined from solid aluminium and it has the familiar stepped form. This plate also houses a shutter speed dial like the Leica M's, and this enables you to set shutter speed in the range of 1-1/2000 sec. When set to the 1 sec position the rear dial enables the shutter speed to be set to longer times, extending up to 30 secs. Unlike the Leica M, which accepts lenses with an aperture ring, the Leica X Vario has an aperture dial on the top-plate with settings running from f/3.5 (the wideangle maximum) in 1/3 stops to f/16. As the shutter speed and aperture dials have an A setting, you can set the camera to shoot in Program mode (with both set to A), aperture priority (with the shutter speed dial set to A) or shutter priority (with the aperture dial set to A). Alternatively, you can take manual control and set the shutter speed and aperture yourself. When the camera is in an automatic or semi-automatic exposure modes, you can set exposure compensation by pressing the up control of the navigation pad on the back of the camera and turning the dial just above the thumb rest. A second press of the up control enables you to set the automatic exposure bracketing values, while a third gives you access to the flash exposure compensation control. In a confusing change from the Leica X2, but like the Leica M, the button at the centre of the Leica X Vario's navigation control is labelled 'Info' and the 'Menu/Set' button is to the left of the screen. It doesn't take long to get used to it, but anyone switching from a Leica X2 may find they press the wrong button a few times. On the subject of pressing the wrong button, while we were handling the Leica X Vario we accidentally pressed the navigation control and thumb-wheel a few times. We didn't change any settings when doing so, but this is something we'll have to look at when we get a chance to spend a bit more time with the camera. We also found that it's easy to flick the power switch too far when turning the camera on, so that instead of shooting in single shot mode the camera is set to continuous shooting mode. One of the criticisms levelled at Leica for the X2 was the use of a low-resolution screen in a premium compact camera. Leica hasn't made the same mistake with the Leica X Vario, and it has a 3-inch 920,000-dot LCD that provides a nice clear view. As we got to use the Leica X Vario prior to its announcement, we weren't able to take it outside or shoot with it extensively, but the screen doesn't appear to suffer excessively from reflections. The menu is very clear and seems sensibly arranged. It has all the options you'd expect, without being too extensive, which means it's fairly easy to find what you need. Leica has given the Leica X Vario's lens two rings. The front one, furthest from the camera body, is the zoom ring. This is fairly stiff, but not excessively so, and you're unlikely to change focal length accidentally. The ring nearest the camera body is the focus ring. When this ring is set to the AF point, the camera will focus automatically, but when it's rotated away from this setting the focus is set manually. A helpful focus assist mode enlarges the centre of the screen to enable precise focusing, and this is when you appreciate the high-resolution LCD screen. Although the Leica X Vario that we were able to shoot with was a full-production model, we weren't able to take it outside of Leica UK's Mayfair offices. Naturally this means that we were very restricted with the subjects that were available to photograph. You can see the results of our shooting on the next page. However, our first impressions are that the Leica X Vario is capable of capturing a high level of detail, and noise is generally well controlled. Shots taken at ISO 6400 have a fine-grained texture that is visible when sized to make A3 sized (16.5 x 11.7-inch) prints. At the default settings there isn't much in the way of coloured speckling visible in either the raw or JPEG files, and there's no banding or clumping of noise. As usual noise becomes more visible in shadow areas, but it isn't especially offensive, and our limited experience with the Leica X Vario indicates that ISO 6400 is a safe upper limit. Even at ISO 12,500 the Leica X Vario produces decent results, although naturally chroma noise is more evident in the shadow area. The JPEGs are slightly softer at 100% than the simultaneously captured raw files, but the colour noise is also slightly less visible. We'll need to shoot more images in a range of conditions to be sure, but it seems that Leica has gone down the road of preserving detail at high sensitivity settings and enabling some noise to be visible - an approach we applaud. There's no sign of smudging or smearing that is sometimes seen when an image is softened to hide noise and then sharpened in-camera to bring out edge detail. Direct from the Leica X Vario, images are nice and vibrant in the Standard Film mode while the results from the Black and White Natural mode look good, though most users are likely to use them as a guide and will adjust their raw files using the supplied Adobe Lightroom 5 software. Distortion also appears to be well controlled, with just slight barrelling being noticeable with close-to linear subjects at the 28mm end of the lens. Scrutinising images with high contrast edges reveals that chromatic aberrations are well controlled, with just a suggestion being visible here and there. It doesn't look like we will be finding any major issues with it when we test the camera more thoroughly. One area of potential disappointment with the Leica X Vario is its automatic focusing system. Being a mirrorless camera, this is contrast detection-based, and compared with the systems inside the likes of the Panasonic G6 and Sony NEX-6 it is slow. It also struggled to latch onto a couple of targets that wouldn't have troubled some other cameras. On a more positive note, it's very quick and easy to switch into manual focus mode, and this is likely to suit many of the Leica faithful more than automatic focusing anyway. Having only had a very brief period in which to shoot a few images from within an office, we don't want to jump to conclusions about the Leica X Vario. However, early indications for image quality are very positive. The Leica X2's image quality is generally highly regarded, and the fact that the Leica X Vario uses the same sensor - albeit with tweaked processing - bodes well. Our few sample images indicate that the new camera captures lots of detail and noise is sympathetically handled. Leica knows how to make cameras that feel good in the hand, and the Leica X Vario is no exception. It feels superbly made and built to last. We also appreciate the way that Leica processes images in-camera. It enables some noise to be visible so that the detail is also there. We'll need to shoot with the Leica X Vario a little more to see how much of an issue the positioning of the controls in relation to the thumb rest is - if it is an issue, it may just be one of those things that is irrelevant once you get used to the camera. The same may be true of the power switch that seems to slip too easily towards the continuous shooting point. 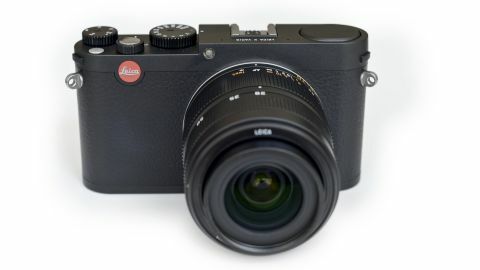 When the Leica X2 was launched it was billed as the smallest APS-C format camera available. This crown may have been stolen by the Ricoh GR, but it is still a very compact model. The body of the Leica X Vario is only a little bigger than the X2's, but the lens is much bigger. This makes the camera fairly bulky. We are also a little concerned about the speed of the autofocusing system, which lags behind that of some (more affordable) compact system cameras such as the Panasonic G6, Sony NEX-6 and Olympus E-PL5. There's no getting away from the fact that the Leica X Vario is a very expensive camera. But in the same way the Bugatti doesn't set out to compete with popular cars such as the VW Golf, Leica doesn't make cameras to compete with mainstream models. Leica is an exclusive brand. It will be interesting to see how the Leica faithful respond to the Leica X Vario, especially given its Mini M billing and 18-46mm f/3.5-6.4 zoom lens. You don't expect lots of mod cons with a Leica camera, you expect a high standard of design and construction and superb image quality. On the face of it the Leica X Vario seems to deliver it, but we need to test it further to be certain.